Fangirls Going Rogue welcomes Amy Ratcliffe of Star Wars Blog, IGN, and Nerdist. Amy became a Star Wars fan through The Clone Wars, so we asked her about some of her favorite episodes. Keeping with our theme of exploring how to make the leap from fan to professional, Amy doles out advice: work hard, write, and write some more. Amy’s personal website Geek with Curvesshowcases how to build a fan résumé. Teresa and Tricia used Amy’s fashion sense to unlock the mystery of wearing leggings. Finally, the ladies chatted about February’s famous holiday: Valentine’s Day. Thanks to Star Wars Kidcast for their coverage of the holiday and specifically A Very Vader Valentine’s Day. James Arnold Taylor stopped by for an amazing interview. He shared insights into the inspiration behind his new book JAT 365 and about experiencing Star Wars with the fankids in our lives. Teresa and Tricia both had a chance to offer testimonials on the ways James has inspired us. JAT 365 is an awesome tool to bring his positive outlook into your daily life. 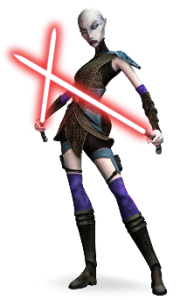 For the character discussion this month, Tricia picked Asajj Ventress. Teresa posed the question, is magic the same thing as the Force? You’ll have to tune in to find out the responses, and feel free to weigh in. Keeping with the fashion theme, Tricia, Teresa, and Amy chose their favorite Asajj Ventress look. You can reach Amy Ratcliffe on Twitter at @Amy_Geek. You can connect with James Arnold Taylor through his website JamesArnoldTaylor.com and on Twitter@JATactor. Tricia’s novel Wynde is available in print and ebook on most platforms, including Amazon, Nook, Smashwords, and CreateSpace. For more information check out TriciaBarr.com.